Welcome to the cottage on the peninsula Zudar fox. Our spacious holiday home is freshly painted in 2017 and offers 123 square meters of space for 8 people. The house consists of 3 floors and has 4 bedrooms. Of the sleeping loft in the attic (3 flat beds, Velux windows) from the 'children' is accessible. Two rooms with a balcony. Travel cot available. On the ground floor there is a guest toilet (tooth brushing and "Katzenwäsche"), in the 2. Floor a bathroom with bath and shower. All rooms are equipped with tile or Laminate designed. The kitchen has oven, microwave, dishwasher, washing machine, toaster and dishes. The 600 square meter garden is fenced and offers under the carport parking for 2 to 3 cars. 4 simple bicycles belong to the house and can be used free of charge. Bakery and Laundry possible in the opposite administration. Ital. Restaurants are across the street - with Sky TV. The peninsula is an ideal Zudar recreation and leisure area for families, friends with and without dogs. From here you can take exciting trips by car, by bike or on foot. The bird sanctuary of the peninsula you can observe rare birds, or take long walks on the beach and in the nature reserve Great Schoritzer Wiek. The Rügen bike path starts right at your doorstep. By bike you can explore the island ideal. Plan the Orlando Furioso from Putbus of having one, they can make their route planning easy. Stralsund is also easily accessible by bicycle. The bike path leads directly to the historic Hanseatic city, popular shopping and sightseeing. At the port there is the Ozeaneum. The Ozeaneum is Europe's Museum of the Year 2010 and invites young and old to a fascinating underwater journey. The marinas Puddemin and Lauterbach are nearby. There are numerous restaurants serving fresh regional cuisine. Rügen has many farm shops and farmers' markets, with programs and games for children. The ferry service to the island Hiddensee can be reached by Zudar in about 20 minutes. Ferries and water taxis are in daily Pedelverkehr go. The chalk cliffs and Cape Arkona are equally worth a visit, as the remarkable resorts Göhren and Sellin with its famous pier. Here invite avenues to stroll and relax. The most famous seaside resort on Rügen is Binz. A lively seaside resort with a great beach promenade, many shops, restaurants and sidewalk cafes. Living-dining area and kitchen lined with stone tiles. Sleeping area on the first floor completely covered with laminate. Very easy to clean. 2017 partly freshly painted. Wir haben uns hier sehr wohlgefühlt! Im Haus war alles vorhanden, was für einen Ferienaufenthalt nötig ist. Die Betreuung vor Ort war gut organisiert und es gab immer einen Ansprechpartner. Uns hat die Lage, in einer nicht so erschlossenen Region, sehr gut gefallen - mit Hund einfach entspannt! Und mit dem Auto ist auch ein Besuch am Strand der Seebäder kein Problem. Wir kommen bestimmt einmal wieder! Für Familien ist das Haus, der Garten, der STrand und die Insel insgesamt einfach super. Endlich gibts auch WLan in Haus. Wir kommen immer wieder gerne. Jeden morgen in der Sonne frühstücken. Schwimmen im nahe gelegenen Bodden. Alles super. 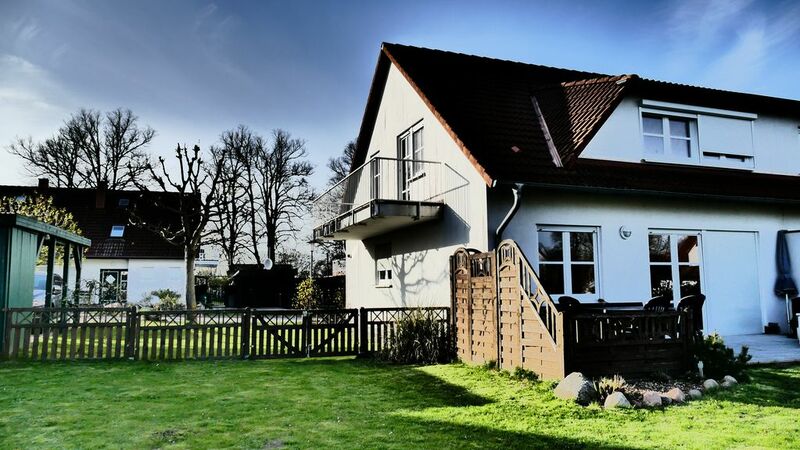 Haus sehr großzügig und ideal für Familien. Ein toller Urlaub. Es hat an nichts gefehlt. The parklike setting consists of several semi-detached houses and is located on the peninsula Zudar. The property is ideally located in the countryside, and the generosity of the houses. Losentitz is ideal for large and / or families traveling with children who want to spend a holiday together. Ideal for dog owners. The Glewitzer ferry provides direct access to the mainland with the Greiswald and Stralsund are within easy reach. W-LAN from 2018. Since 2017 a great ital. Resto opposite - with Sky TV. Losentitz located on the peninsula Zudar, directly on the German Avenues. With the Glewitzer ferry there is a fast connection of Stralsund and Greifswald. The United Schoritzer Wiek's bird and nature reserve with kilometers of unspoilt beaches. Directly at our holiday and residential complex begins the Rügen - cycle path, which invites you to nearby attractions. The marina Puddemin is about 3 km. Zudar has a sanctuary in bulk Schoritz the birthplace of Ernst-Moritz Arndt is visible. Wide open fields and meadows, dunes and fringed by pine forest beaches invite for long walks. By car the Seebänder Binz, Sellin and Göhren are within easy reach. The historic town of Putbus has a weekly market and numerous shops and an extensive wildlife park. The Golf Centrum Schloss Karnitz is about 10 km away.